When students come to the lab, they have access to 30 Dell computers with high speed Internet access, a presentation workstation, and a library with over 6,000 books. 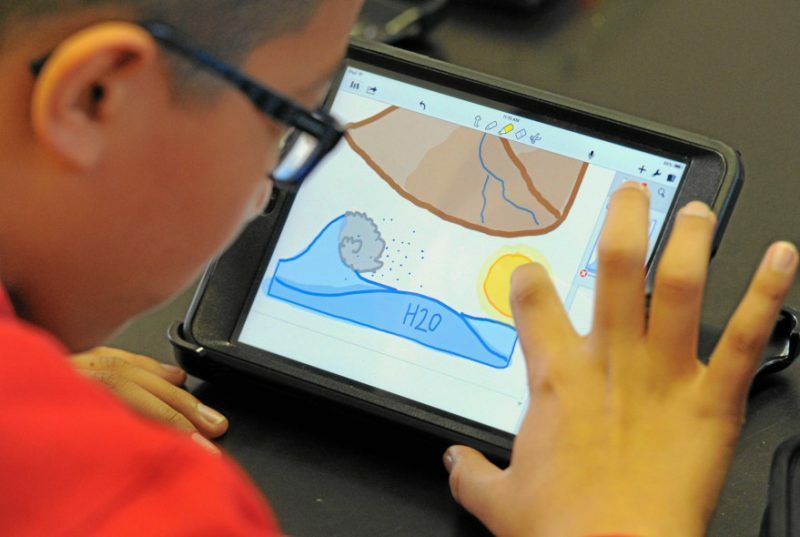 Students learn to use the best “technology” for the task at hand as they are challenged by learning environments designed to enhance core curriculum objectives by incorporating computers, the Internet, videos, software, books, manipulatives, and Alpha-Smarts. Kindergarten students come to the language lab for an hour each morning to work in a language-rich environment that incorporates six learning centers, each of which is designed to encourage and support reading and writing skills. 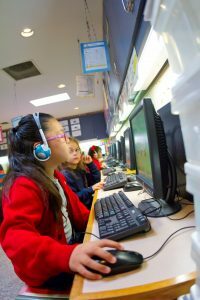 Students use Writing to Read software at the Computer Center to learn and practice sounds (phonemes). At the Work Journal Center, they practice writing those sounds, and at the Make Words Center they use games and manipulates to make words using the sounds they are learning. At the Activity Center, students use Scholastic Interactive Phonics software to practice phonics, sight words, and reading, and use Starfall.com and educational software for more practice with words. The Tape Library Center is filled with recorded stories that the students listen to as they follow the text in their books. The “heart” of the lab is the Writing/Typing Center, where students use everything they are learning to write stories and to read those stories to teachers, parents and other students. This is an energetic hour each morning that supports literacy and encourages active involvement by the students. 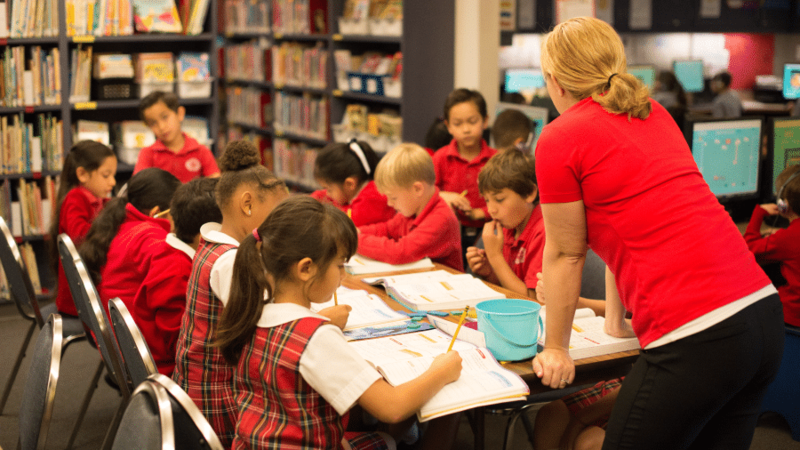 1st grade students come to the language lab for an hour each morning to work in a language-rich environment that incorporates six learning centers, each of which is designed to extend and enhance their literacy skills. At the beginning of the year, students continue the Writing to Read program to build their reading and writing foundation. They then transition to Scholastic Interactive Phonics software at the Computer Center to practice phonics, oral reading and sight vocabulary. They follow these activities with paper and pencil practice at the Work Journal Center, and hands on phonics and sight word practice at the Make Words Center. The Spell It Center uses Spell It Deluxe software to provide practice with spelling and decoding sentences, and the Activity Center uses Starfall.com and educational software for more practice decoding words and reading orally. More stories are read at the Tape Library Center and the Leap Pad Center. Writing is still the key component in this centers-based learning environment and students are encouraged to write using the 6 + 1 traits of writing. During the Spring, students write essays on how they will protect the earth. These essays are recorded by the students and presented with their illustrations as digital stories on our website. 2nd grade students come to the lab each morning and participate in a centers-based learning environment designed to support the California Language Arts Content Standards for 2nd grade. Students use Riverdeep’s Destination Reading software at the Computer Center. Paper and pencil activities are provided at the Work Journal Center to reinforce skills. The Spell It Center provides spelling and vocabulary practice using Spell It Deluxe software. At the Writing Center, students begin basic formatting in MS Word and incorporate 6+1 traits of writing and the writing process into their writing experiences. During the Spring, students write biographies, select digital images and record their essays to present as digital stories on our website. Students use Accelerated Reader to develop their reading comprehension skills and begin keyboarding using Sunburst’s Type to Learn software. 3rd grade students expand their word processing skills in MS Word as they continue developing their writing skills incorporating 6 + 1 traits of writing. Students are introduced to Internet Explorer and basic web browser navigation techniques and terminology as a foundation for the research they do on the Internet. They are introduced to MS PowerPoint, creating class e-books and presentations. They use Photo Story to create digital stories from their creative writing projects. They use Accelerated Reader to improve their reading comprehension, and continue keyboarding with Sunburst’s Type to Learn software. 4th grade students discuss the rules for safe and ethical Internet use. They expand their formatting skills and create and format tables in MS Word. They continue to develop their writing skills incorporating 6+1 traits of writing. They use Photo Story to create digital stories from their creative writing projects. They learn to use MS Excel to record data and graph their results. They learn to use Inspiration software to create Venn diagrams, graphic organizers, and story webs. They continue to use Accelerated Reader to improve their reading comprehension. They also continue to keyboard, using Type to Learn in the Language Arts Lab, along with daily typing on Alpha Smarts in their classroom. 6th grade students review the rules for schoolwide computer use and discuss the school’s Acceptable Use Policy. They explore Internet safety issues and responsible Internet use, including plagiarism and online safety. Students learn about authenticating online resources and discuss online marketing and privacy. Students practice identifying safety issues and choosing the appropriate safety strategies. They review and extend their knowledge of web browser terminology and navigation and use and manage bookmarks. They review formatting procedures in MS Word, follow MLA style guidelines, and incorporate 6 + 1 traits into their writing experiences. They use Photo Story to create digital stories from their creative writing projects. Students continue to use MS Excel to create charts and organize data. Media literacy activities round out the year as students are challenged to think critically as they analyze media. 7th grade students review the rules for school wide computer use and discuss the school’s Acceptable Use Policy. They practice choosing appropriate safety strategies for online privacy and marketing. They discuss responsible Internet use and safety, and practice validating online information. Students review web browser terminology and navigation and manage bookmarks. They review formatting procedures in MS Word, follow MLA style guidelines, and incorporate the 6 + 1 traits into their writing. They use Photo Story to create digital stories from their creative writing projects.They use MS Excel for charts and tables and MS PowerPoint for oral presentations and multimedia projects. They continue to build their critical thinking skills as they broaden their media literacy skills. 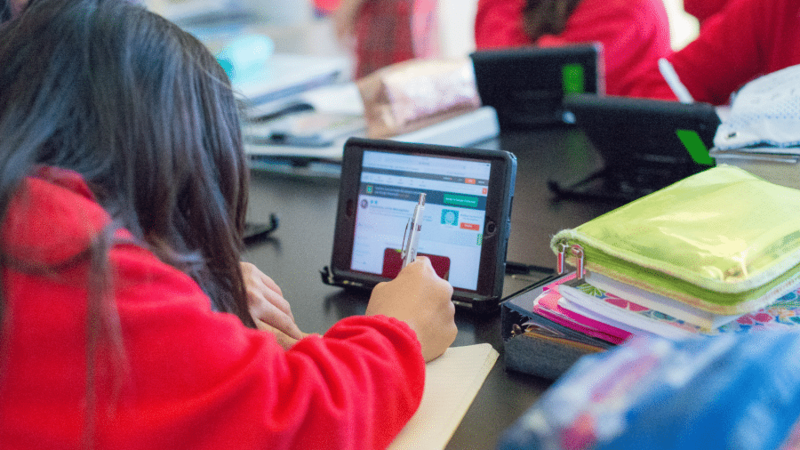 After students review the rules for schoolwide computer use and discuss the school’s Acceptable Use Policy, they practice choosing appropriate safety strategies for online privacy and marketing, discuss responsible Internet use, plagiarism, and safety, and practice validating online information. Students review web browser terminology and navigation and manage bookmarks. They review formatting procedures in MS Word, follow MLA style guidelines, and incorporate 6 + 1 traits of writing. They use Photo Story to create digital stories. They use MS Excel to create charts and tables and to analyze scientific data. They develop a multimedia slide show in MS PowerPoint entitled My Conversation with God, and choose appropriate technology tools for their core subject projects. They are challenged to continue to build their critical thinking skills as they broaden their media literacy skills.